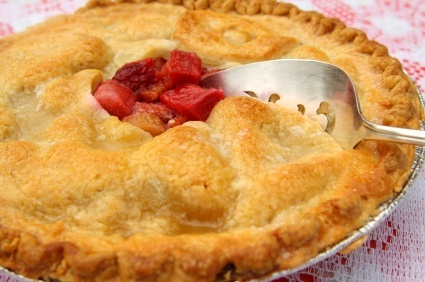 My best strawberry rhubarb pie recipe is amazing. It's tart, it's sweet, it's delightful. I've also included my strawberry rhubarb crisp recipe that is a delight with homemade vanilla ice cream. In a large bowl combine the rhubarb, strawberries, white sugar, cornstarch, lemon juice and cinnamon. On a lightly floured surface, roll out half of the pastry and place in a pie plate. Spoon in the fruit filling. Top with pieces of butter. Roll out the dough for the top crust. Using a knife or pastry wheel cut dough into 1 inch strips, or just use as a regular top crust. Brush the rim of the crust already in the pie plate with the beaten egg and gently weave the strips over the pie. Trim and flute the edge. Now brush the lattice with the egg, and bake the pie on a cookie sheet to catch any juice that drips. Bake the pie for 20-25 minutes; or until the top crust is golden, then reduce heat to 350 degrees and bake another 35 to 40 minutes or until the pie juices are bubbling and the crust is golden brown. Let cool. Serve with my awesome homemade whipped cream. 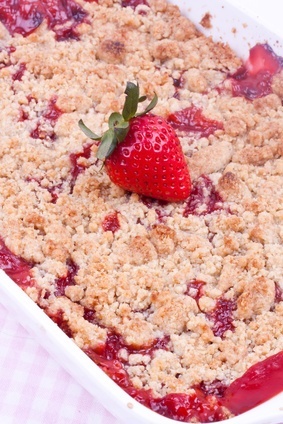 Also known as Strawberry Rhubarb Crumble, this easy strawberry recipe is awesome with some creamy homemade ice cream. PREHEAT oven to 350 degrees. Grease a deep pie dish. In a large bowl, combine the fruit and 3/4 cup white sugar. Dissolve the cornstarch in the orange juice and mix in with the fruit mixture; pour into the pie dish. In another bowl, mix together the flour with the remaining 1/2 cup white sugar, 1/2 cup brown sugar, oats. Add the butter and blend until mixture looks like corn meal. Sprinkle this over the fruit and lightly pat it down; bake for 45 minutes. Recipe adapted from Ina Garten.